Police and other authorities across America were on the lookout for Emma Goldman. Once her inflammatory reputation began to precede her, she found some towns would close their lecture halls, prohibit her from attending meetings, or even arrest her and hustle her out of town, rather than allow her to deliver her prepared lectures. She was arrested often, on a variety of charges, and harassed innumerable times. Browse Goldman's rap sheet, as compiled by the Emma Goldman Papers Project at the University of California, Berkeley. With the nation in a deep economic depression, Emma Goldman is arrested and charged with inciting a riot during a New York City speech to unemployed workers on August 21. Goldman is tried, found guilty, and sentenced to one year in the Blackwell's Island penitentiary -- on the island today known as Roosevelt Island, in New York's East River. Her story of prison life is published in the New York World a day after her release on August 17, 1894. Goldman is arrested in Providence, Rhode Island, when she attempts to speak in public, after the mayor has warned her not to deliver any more open-air speeches. She has been traveling to speak on anarchism, women and marriage, Spanish political events, and Alexander Berkman's imprisonment for the murder of Henry Clay Frick. After keeping Goldman in jail overnight, the Providence authorities order her to leave town or face a three-month prison term. Goldman is arrested in Chicago under suspicion of having something to do with President William McKinley's assassination in Buffalo, New York, four days earlier. She had met assassin Leon Czolgosz at one of her lectures. The Chicago police interrogate Goldman and her bail is set at $20,000 (over $400,000 in today's dollars). She will be released two weeks later, and the case will be dropped for lack of evidence. The year after New York passes an anti-anarchism law, Goldman and Max Baginski are arrested in New York City for being "suspicious persons." They are questioned and released. 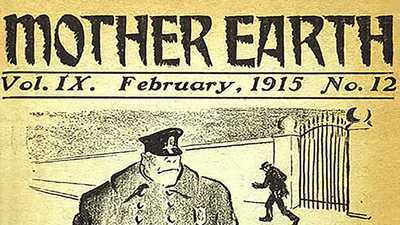 Along with nine other people, Emma Goldman is arrested in New York City for articles published in her Mother Earth magazine, and for inciting to riot. She pays the $1,000 bail for her release, and pleads not guilty to charges of criminal anarchy. On January 9, 1907, a grand jury dismisses the case. Cause of Arrest: Public Expression of "Incendiary Sentiments"
New York City's Anarchist Police Squad arrests Goldman during a public lecture on "False and True Conceptions of Anarchism." The case will later be dismissed. Seattle authorities arrest Goldman after someone breaks in to a locked lecture hall to allow the room to be used for a meeting with Goldman. The police release her on the condition that she leave town. With her reputation preceding her, Goldman is arrested in Bellingham, Washington, before she can deliver a planned lecture. The next day, authorities send her away on a Canada-bound train. After two weeks of uneventful Goldman lectures in California, San Francisco police arrest Goldman with Ben Reitman and charge them with conspiring against the government. Supporters who protest the arrest are disbanded by police the next day, but Goldman remains locked up until January 18. On the 28th, authorities drop the charges against her. In the midst of a large, successful national lecture tour, Goldman and Reitman arrested by police in Cheyenne, Wyoming during an open-air meeting. A year after being attacked by vigilantes when they arrived at the San Diego train station during a battle over free speech there, Goldman and Reitman return to the city -- only to be arrested as soon as they arrive. Police send them on the afternoon train to Los Angeles. In Portland, Oregon on her annual lecture tour, Goldman is arrested with Ben Reitman for distributing information on birth control in defiance of the Comstock "Chastity" Laws. A friend posts the $500 bail; the next day, Goldman and Reitman pay a $100 fine and resume lectures in that city. Goldman is arrested in New York City for delivering a January lecture on birth control. She is tried in April; after being convicted, she opts to spend fifteen days in the Queens County Penitentiary instead of paying a $100 fine. Emma Goldman goes to court in New York City to testify on behalf of a fellow birth-control advocate, and is arrested herself. She is released on a $500 bond and will be acquitted of the charge on January 8, 1917. The U.S. enters World War I in April 1917; since then, Goldman has been lecturing against military conscription and the war. 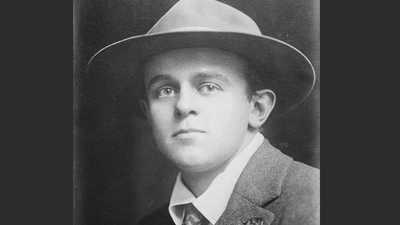 The same day that President Woodrow Wilson signs the Espionage Act, which in part prohibits interfering with the draft, federal agents arrest Goldman and Alexander Berkman in New York City. They are later indicted for conspiring to violate the Draft Act. Goldman pleads not guilty and is freed on $25,000 bail; rumors spread that her bail has been paid by the German enemy. In early July, she and Berkman are both found guilty and sentenced to serve two years in jail and pay a $10,000 fine. Goldman is incarcerated in a federal penitentiary in Jefferson City, Missouri. When her case is appealed to the U.S. Supreme Court, Goldman is returned to New York City and again released on bail. After losing her appeal in January 1918, Goldman is returned to Missouri to serve her two-year sentence. Federal officials review Goldman's immigration status and decide she can be deported legally. They serve Goldman with a warrant for her arrest and deportation while she is serving the final few weeks of her prison sentence in Missouri. After a bond of $15,000 is posted, Goldman returns to New York to organize her appeal. In October, Goldman claims U.S. citizenship from her brief marriage to Jacob A. Kersner in 1887. But Labor Department officials order Goldman's deportation in late November, and in early December she and Berkman are held at Ellis Island in New York harbor, and on the 21st of that month they board a Russia-bound ship. Leaf through the pages of the Emma Goldman's showcase magazine. 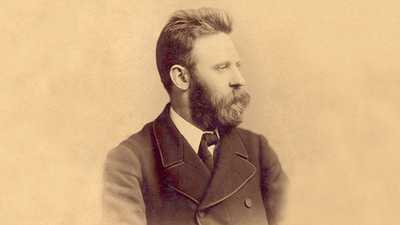 German-born Johann Most would grow up to become an anarchist firebrand, an influential figure whose beliefs were often misrepresented.